Starting from Docker 17.05+, you can create a single Dockerfile that can build multiple helper images with compilers, tools, and tests and use files from above images to produce the final Docker image. Docker can build images by reading the instructions from a Dockerfile. A Dockerfile is a text file that contains a list of all the commands needed to build a new Docker image. The syntax of Dockerfile is pretty simple and the Docker team tries to keep it intact between Docker engine releases. The core principle is very simple: 1 Dockerfile -> 1 Docker Image. This principle works just fine for basic use cases, where you just need to demonstrate Docker capabilities or put some “static” content into a Docker image. Once you advance with Docker and would like to create secure and lean Docker images, singe Dockerfile is not enough. People who insist on following the above principle find themselves with slow Docker builds, huge Docker images (several GB size images), slow deployment time and lots of CVE violations embedded into these images. Create additional Docker images with required tools (compilers, linters, testing tools) and use these images to produce lean, secure and production ready Docker image. This flow assumes that you are using two or more separate Dockerfiles and a shell script or flow tool to orchestrate all steps above. I use a fork of Let’s Chat node.js application. What is Docker multi-stage build? Docker 17.0.5 extends Dockerfile syntax to support new multi-stage build, by extending two commands: FROM and COPY. 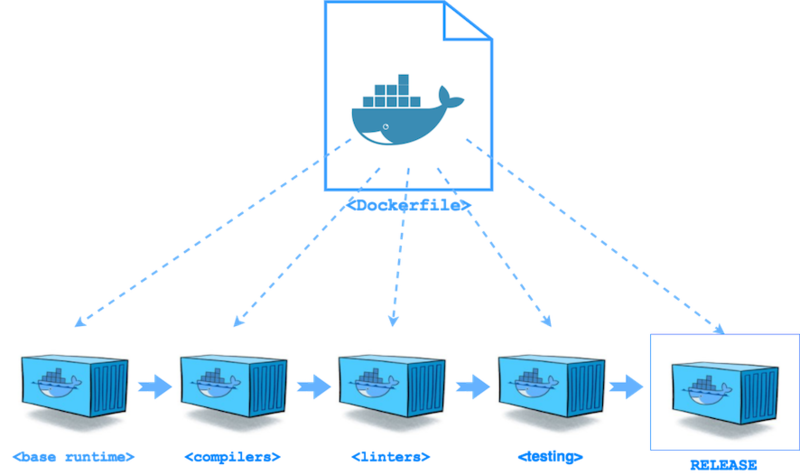 The multi-stage build allows using multiple FROM commands in the same Dockerfile. The last FROM command produces the final Docker image, all other images are intermediate images (no final Docker image is produced, but all layers are cached). The FROM syntax also supports AS keyword. Use AS keyword to give the current image a logical name and reference to it later by this name. To copy files from intermediate images use COPY --from=<image_AS_name|image_number>, where number starts from 0 (but better to use logical name through AS keyword). The Dockerfile below makes the Build Container pattern obsolete, allowing to achieve the same result with the single file. The above Dockerfile creates 3 intermediate Docker images and single release Docker image (the final FROM). In order to try Docker multi-stage build, you need to get Docker 17.0.5, which is going to be released in May and currently available on the beta channel. Try mult-stage build. Add --host=:23751 to every Docker command, or set DOCKER_HOST environment variable. $ docker --host=:23751 build -t local/chat:multi-stage . $ docker build -t local/chat:multi-stage . With Docker multi-stage build feature, it’s possible to implement an advanced Docker image build pipeline using a single Dockerfile. Kudos to Docker team!